Identify what is wrong with your project. Develop a plan to correct it. Understand the measures required to prevent reoccurring failure. The focus of a recovery is not on applying processes to run the project; but, rather . problems will continue to haunt you. Understand the dynamics behind failing project. Learn to identify the early signs. 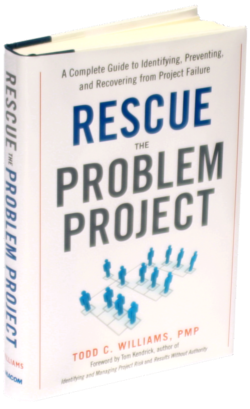 The internationally acclaimed Rescue the Problem Project has been used by executives, project managers, instructor, and students around the world to improve success rates. Explore more, including reading the first part of the book. There are many options for buying Rescue the Problem Project. You can purchase it from us (and get a signed copy), buy it from one of the big box stores, or get it from you local book retailer. If you choose to buy it from us, you will also find other items that are either free, fun, educational, or all three!